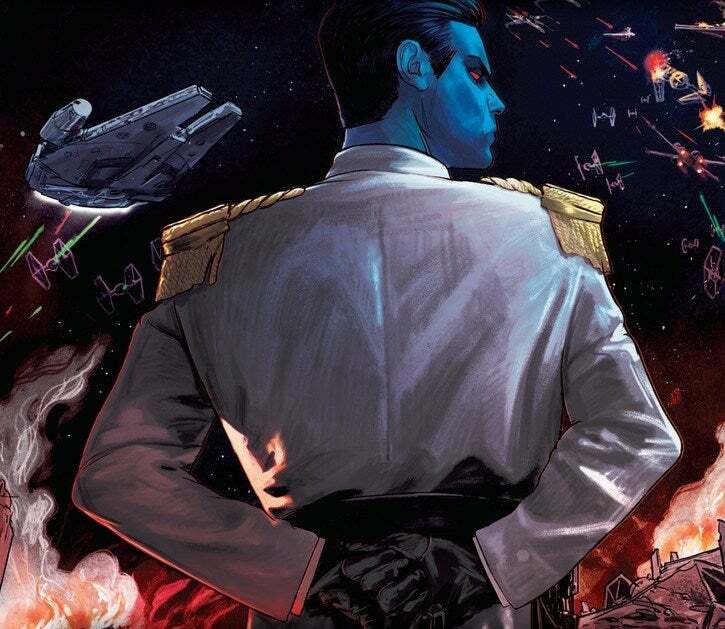 Next week, Timothy Zahn's Thrawn, a book about the rise to power of everyone's favourite Grand Admiral, will be released. I've never anticipated a Star Wars book more, and now seems like the right time to look back at the books that introduced him and evaluate if they really were as great as popular wisdom says they were. We've talked about Grand Admiral Thrawn and why his appearance in Star Wars: Rebels was, for some fans, such a huge deal. And when Disney bought Lucasfilm and announced that the old books would no longer be canon, one of the biggest outcries was over losing Thrawn and another Zahn creation, Mara Jade, from the universe. In fact, a lot of emphasis has been on Thrawn alone, and not as much about why the stories he appeared in were so revered. 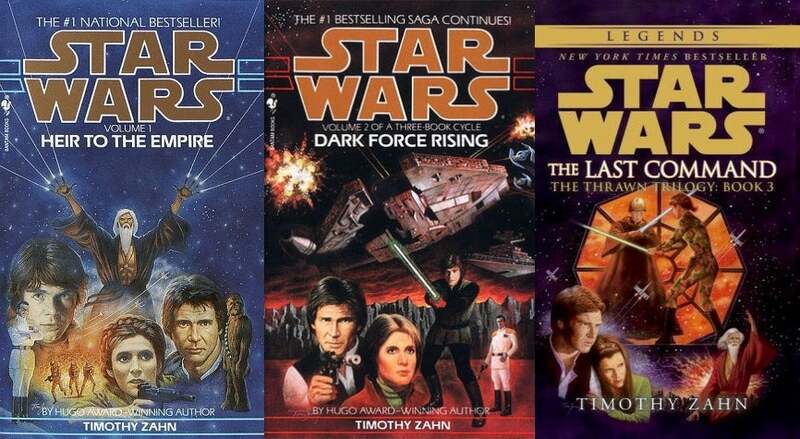 Timothy Zahn's Heir to Empire was released in 1991, followed by Dark Force Rising in 1992, and The Last Command in 1993. This trilogy is largely credited with breathing life into the Expanded Universe and revitalizing Star Wars as a whole. It invented a lot of things that fans later took for granted. It is beloved, but it's also got a few ridiculous parts. To summarize the original Thrawn trilogy is hard. 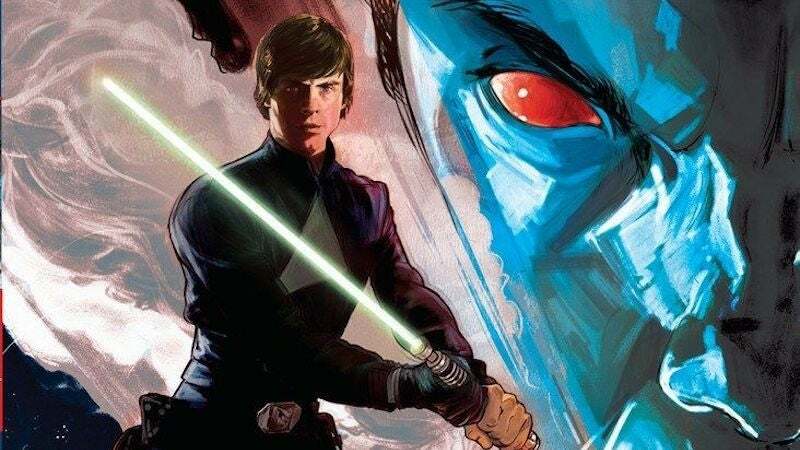 Roughly, it follows the campaign of the newly re-appeared Grand Admiral Thrawn to unseat the New Republic and put the Empire back in charge of the galaxy. Thrawn's plans for that are complex, to say the least, but very effective. Of course, along the way, it has Leia giving birth to twins, political infighting among the upper echelons of the New Republic, a returned dark Jedi Master, a whole species of people who worship Darth Vader, the Emperor's secret Force-sensitive operative, and clones. We've also got the ysalamiri, which have evolved to generate anti-Force fields. There are all the names — Zahn's naming conventions are suitably "non-Earth" and also conform to Lucas' tendency toward the ridiculous. The planets Bpfassh and Myrkr stand out, hard. Then, there are the Noghri, a species that think of Darth Vader as a messiah, and when they find out Leia is his daughter, they call her Lady Vader. All the time. Yes, it's meant to be unsettling for her to be identified that way. But, then again... Lady Vader. Do not get me started on Mara Jade hearing the Emperor yell "YOU WILL KILL LUKE SKYWALKER" in her head all the time. It's an important part of the plot and her character, but it is seriously over the top. We also meet Garm Bel Iblis, who left the Rebellion early on because he objected to Mon Mothma's leadership. The Rebel Alliance, valuing democracy and freedom, would obviously have this kind of fractioning. It's the obvious flip side to the Empire's authoritarianism and groupthink. And Zahn portrays it wonderfully. Similarly, Gilad Pellaeon, who is directly under Thrawn, is introduced partially so that Thrawn would have someone to explain things to. But he also gives a perspective on the Empire — that of a mid-level, reasonable Imperial officer — that we were missing. Vader strangled all the others in the movies and Imperial POVs tend to come from the lunatics that kept taking over. Pallaeon's reasonableness gave the Empire a lot more dimension. Image: Last Command cover by Rich Kelly (Lucasfilm/Del Rey) A lot of people playing in this universe would either stick to characters everyone knows and likes, or retread familiar ground. Zahn absolutely doesn't. Thrawn captures the imagination precisely because he isn't egomaniacal like Palpatine or impulsively violent like Vader. We visit a ton of planets we've never heard of. Huge chunks of this story rest on the shoulders of characters we have never met before. Mara Jade is currently a smuggler, formerly a secret operative of the Emperor's, with Force powers. And the fandom loves her. Talon Karrde is a smuggler who is mostly heroic, but not truly idealistic. Star Wars is usually very black and white — these books are very definite about the Empire being bad and the New Republic being good, but have a more nuanced view of both. Every piece of this trilogy comes together in the end, to the point where it's actually hard to figure out what to cut. There's something plot-relevant in almost everything, so if you tried to remove the sillier parts, the good parts wouldn't work anymore. For example, if you cut out Luuke, you lose Mara killing the clone, finally fulfilling the last command implanted in her mind by the Emperor. Without that command, Mara has no reason to reveal her past work for Palpatine. And her being continually forced to work with Luke (one u this time) isn't as funny or dramatic. Pull one thread, and the whole thing unravels. The fact is that you don't need to know the legacy of these books to appreciate them; they're wonderful constructions of plot and character. And I am dying to what from all these books gets remixed for Thrawn.